Samsung Galaxy S10 is finally here! With a classier glass body, it stands first in line to woo your heart and senses. Boasting of a near bezel-less look, and a screen that is wider than its earlier version, S10 is worth upgrading to from your earlier device. The rear camera now offers you telephoto shots along with the wide and ultra wide-angle, just like the human eye will, along with its selfie front camera that is already a winner in the users’ eyes. This beautiful camera needs some protection. 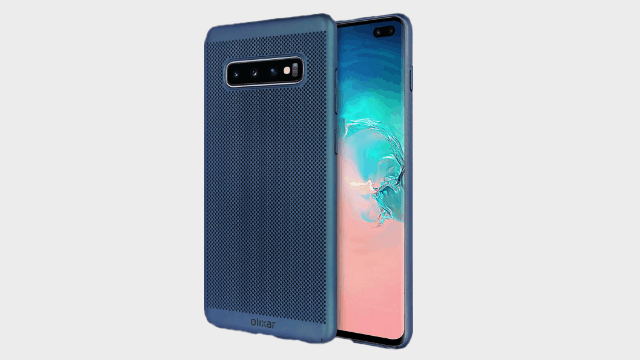 We have scoured the entire market place and picked up the top 20 cases for Samsung Galaxy S10 that guarantee to protect your device while making it look good. Especially, from everyday scratches and bumps but also promise to enhance your personality with style and substance to make it a winning combination. When the phone boasts of a new classy glass body, then there is no point to hide it with a casing cover. Choose the Tozo new design that has a TPU edge and a clear back panel. This simple case has a superb grip and reflects the mirror effect well. The all sided-protection along with a raised edge promises great protection the screen too. A perfect fit, that will enhance the style quotient for you. 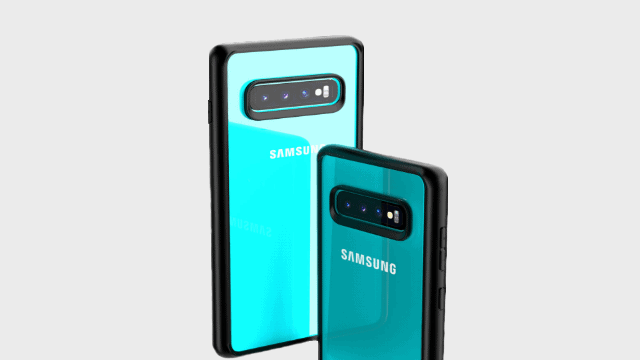 One of the best cases for S10, it is not only beautiful to look at but also promises to not add any bulk to the phone’s lightweight claim. 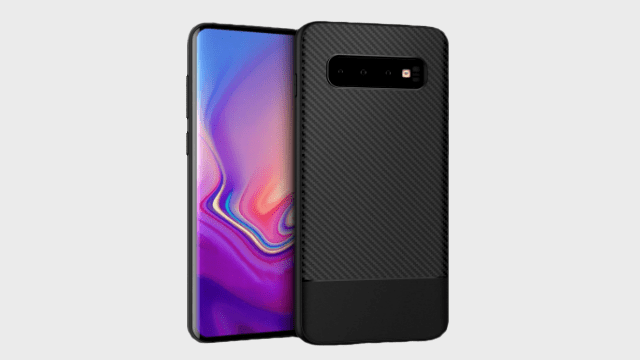 The non-branded surface of this case for S10 promises a unique look that may make it look like a limited edition. So do go for it, if you care for the style as well as great assurance of a shield for its glass body. The added benefit of having a raised camera ring for its multifunctional camera will also keep you satisfied. This case is definitely very thin to slip on and yet offers great protection. Here is a great option for your phone to make it charging friendly. This cover has a solid anti-slip mode and is sure to keep you smiling. The S10 has many great advantages of getting charged. Not only is it designed to optimize its wireless charging capability, but it also can be charged through your friend’s device easily. This Spigen case for S10 has tactile buttons for solid feedback and an easy press cover facility. With its shock-absorbing TPU case that is of polycarbonate bumper, the cover has an upgraded frame that fits the phone very snugly. 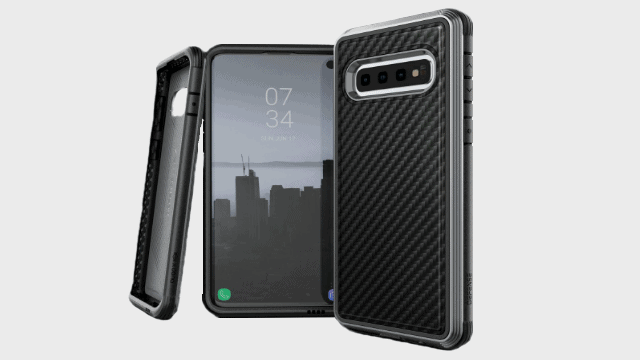 If you are the kind of person who lives in the fast lane and your phone is prone to be dropped often, then be assured this is the best S10 case for you. It is the winner of the CNET annual drop test with most feet dropped, that means your phone feels protected. In addition, the camera ring lets you have a hands-free view from either landscape or two different angles of portrait mode while being a holder too. 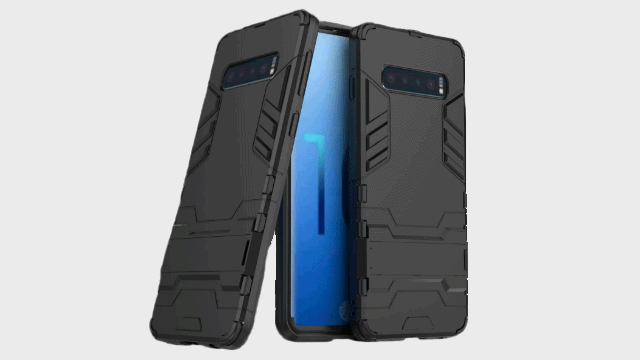 IMPORTANT NOTE: This Galaxy S10 Unicorn Beetle Pro case does NOT come with a built-in screen as the S10 comes pre-installed with an official Samsung screen protector. The case is compatible with Samsung’s official screen protector too. This case for Samsung Galaxy S10 plays out the Cinderella slipper act. A beautiful elegant fit, that shows off the classy glass body of the phone in its full splendor. 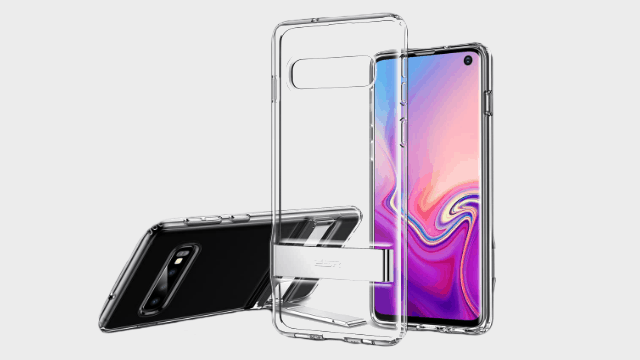 The transparent acrylic cover is compatible with most third-party wireless chargers, screen protectors and other Galaxy S10 accessories too. It has well placed responsive button covers with crisp feedback, precise cutouts, and raised lip protection for the full-screen protection. 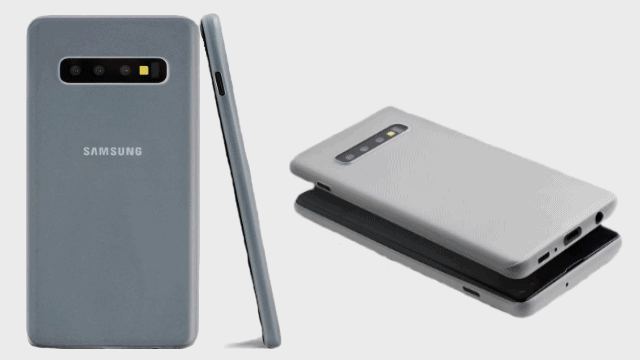 Here a case for Samsung Galaxy S10 that comes in handy when you need to put your phone on a stand all the time. The soft TPU cover has a two-way stand that stands sturdy in both vertical as well as horizontal modes. There are raised screen and camera edges that do help to protect the dainty device against scratches and untoward daily bumps. As it with most of the cases, this too supports wireless charging and one does not need to slip off the case for that. 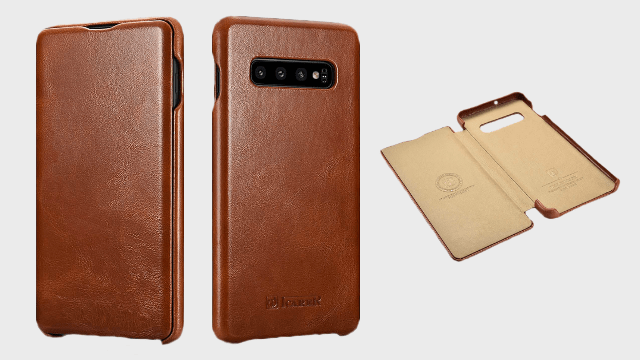 If you are into the sauve leather and suede look then do take a serious look at this case for Samsung Galaxy S10. With a promise of genuine leather, this flip folio one side open case is beautifully stitched with a leather lining body design and is great protection for your mobile. In spite of being hand-made, there are no rough ends to put up with. In fact, the precise cutouts offer an easy access path to all ports, all buttons, sensors, speakers and even the camera on your phone. Here is an S10 case that will look a tad different with its carbon fiber textures ad drawbench brushed aluminum design work. 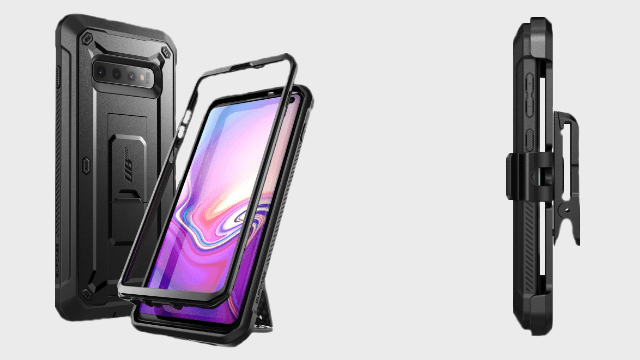 Promising not to add more bulk to the lightweight Samsung Galaxy S10 phone, this case made from a durable TPU body will protect your phone under all circumstances. The raised edge around the screen and the camera cutout are in addition to the provision of a convenient wireless charging. 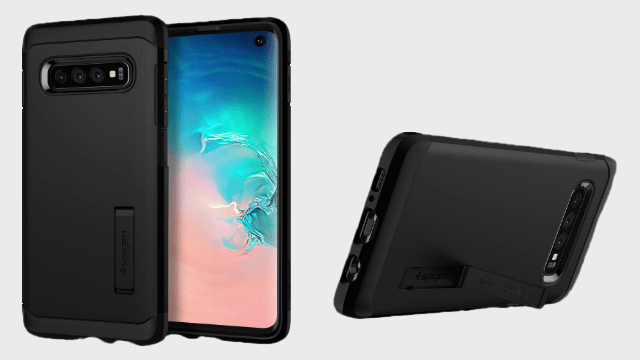 Here is a case for S10 that is designed to optimize wireless charging capability and has a reinforced kickstand too. There are tactile buttons with accurate cutouts and raised lips to protect the beautiful screen and the enhanced camera. The all-around air cushion technology is great for anti-shock protection against all accidental bumps and drops. If all-in-one is your style of life, then we assure you this cover for S10 will surely please you well. This leather crafted wallet case not only provides your phone with the protection it needs but it also acts as a personal card and cash holder. 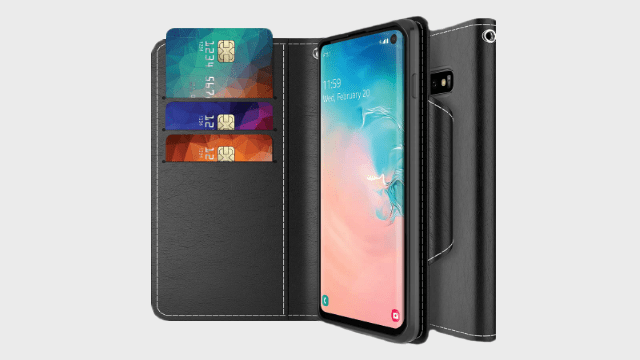 This multifunctional case for Samsung Galaxy S10 will have three card slots and a side pocket for things like money, bills or even more credit cards. In addition to its magnetic lock design, it has a kickstand feature that lets you have a great hands-free viewing experience. If you want to try the friendly power share feature then this case causes no obstruction and of course it offers all the basic security from all scratches, dirt, and every day wear-and-tear. Prefer dual protection for your dainty new Samsung Galaxy S10? Then here is the perfect case for it. Heavy-duty and superb looking too. The HyperPro Case focuses on protection with a double-injected soft and hard casing made from GXD material. It is designed so well that it protects from all kinds of shocks and drops. Furthermore, this innovative GXD shock technology has an anti-grip hold. This ensures that the phone stays safe all the time. The colored bumper and the beautiful transparent back lets you show off the natural elegance of your S10 phone. It is very helpful for the friendly power share feature too. Now you see it, now you don’t! 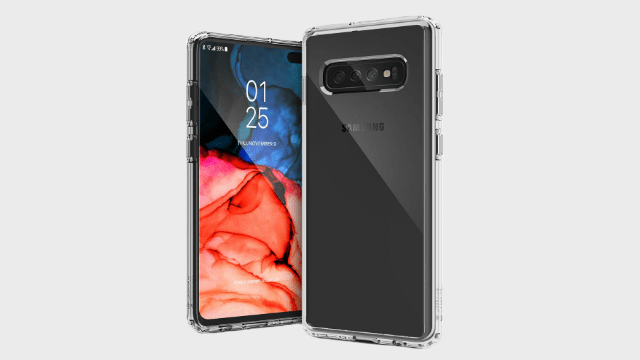 This fully transparent case for S10 is just that. The smooth case is made of an ergonomic matte texture that is extremely comfortable for an anti-slip grip. In addition, the premium PC material has a great smudge free surface. It also keeps your phone protected from scratches and fingerprints. There is maximum security offered for the camera and the screen as it has raised bezel cover lip. 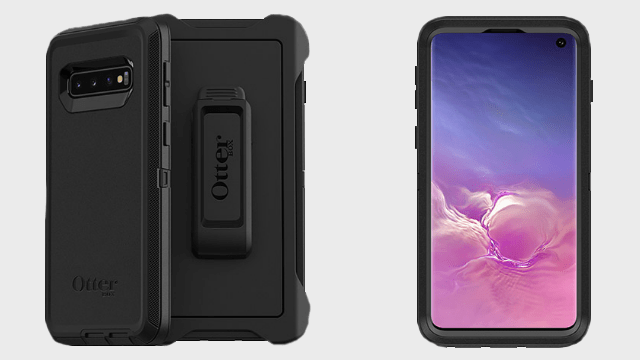 Here is another cover for Galaxy S10 that lets you have a hands-free encounter in more ways than one. With a belt-clip holster, it also has a great kickstand that gives you a convenient viewer experience. There are port covers that are designed to keep out the dust and debris as well. A good choice if you need something out of the ordinary for a phone that is a winner. 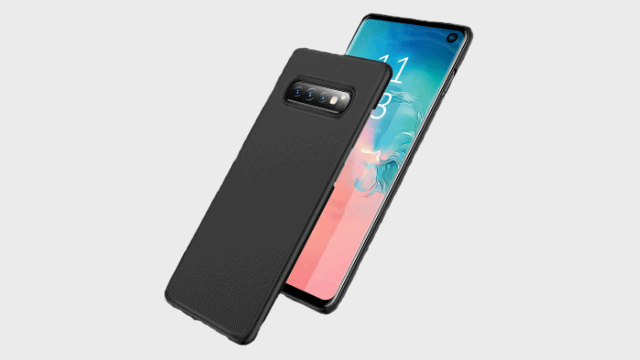 Here is a Samsung Galaxy S10 case that is easy to slip on and off. This one also promises to be of a genuine leather folio case that has a vertical card slot. In addition to all the basic features of a good case, it also has maximum protection from scratches and accidental drops and bumps. This is the one to go for if you want to prefer a rugged look for your phone as well as for self. If nature calms you down then this is the case for you. 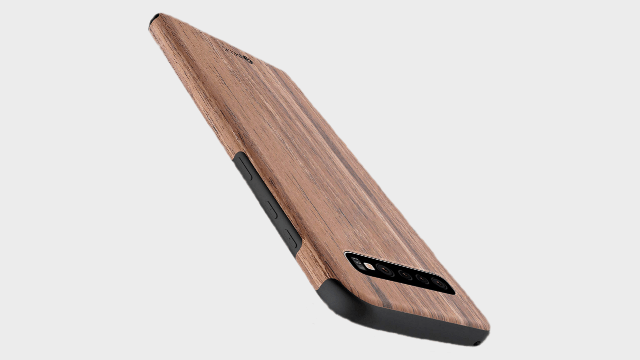 If you prefer the sight of natural wood finishes, then pick this Samsung Galaxy S10 case. It’s reinforced rubber case with softwood back, fits snugly onto your phone. It promises to secure and protect the four corners. In addition, there are precise cutouts for all its openings and buttons. A beautiful cover for the phone’s bezel-less screen display, there are correctly designed cutouts and raised lips for the camera and the fingerprint scanner. It, of course, offers protection from dust, scratches, accidental drops and bumps. It is completely anti-slip and you will simply love its touch to feel secure and protected. Now here is a rather unique case for S10 that promises great sound. With a hard polycarbonate shell covering and raised lips, it is a great shield. The most unique feature is that this one is designed to have an audio channel that not only amplifies the sound but also redirects it. This redirection is to the front so that you get to experience a complete surround sound. It is certified to exceed the Military Grade Drop Test standards making it a great protection option. There are rugged anti-slip and pro-grip luxurious rear back panels that are great to touch. The soft rubber bubble pattern lining promises to absorb and deflect any shocks and bumps from your classy Galaxy Samsung Galaxy S10 phone. 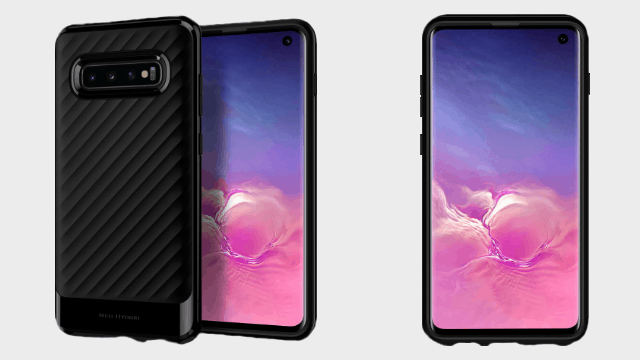 Want an S10 case that breathes? This super thin and lightweight case has a wire like mesh that keeps your device cool through even heat dissipation. One can charge wirelessly without the effort of slipping off the cover. In addition, it also promises you regular features like non-slip coating and precise cutouts for the buttons and ports. 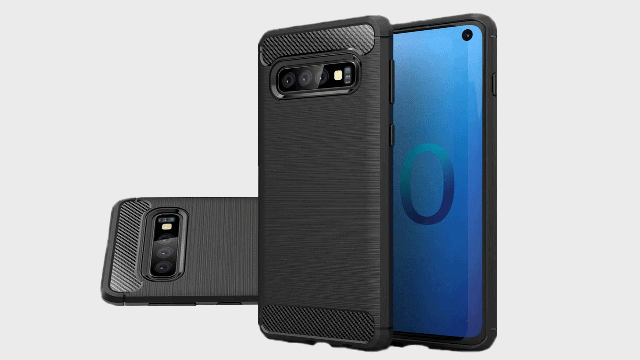 Go for this Samsung Galaxy S10 case, if you tend to be at your phone all the time and need to protect it from overheating. This rugged armored look is for your heavy-duty personality and style. With remarkably professional design and precision cutouts for all buttons and ports, this one is sure to stand tall for you. This is made from polycarbonate hardback cover and it has a flexible silicone inner core. There is a dual layer that super guarantees protection from scratches and bumps. The sturdy built-in kickstand offers a convenient experience for reading, or even watching movies. It is also great for playing games, browsing the web or simply to facetime with friends. If you have invested in the classy glass bodied S10, then you would want a case that will go all out and protect it fully. 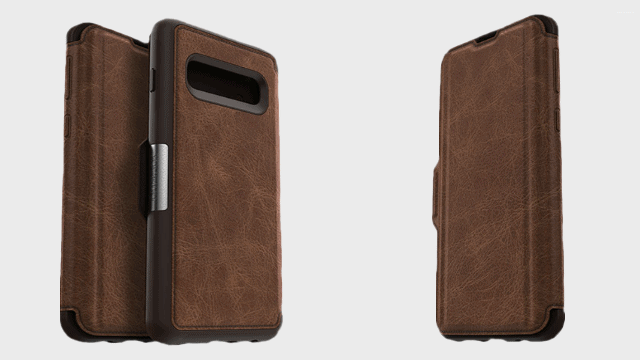 This one made from PU leather is not only designed to protect your phone from bumps and drops. In addition, it is also is built for an excellent grip and comfort. Besides looking extremely elegant, it promises to be great value of protection for your device investment. When your phone has a glass body, then you would want it to be encased properly. 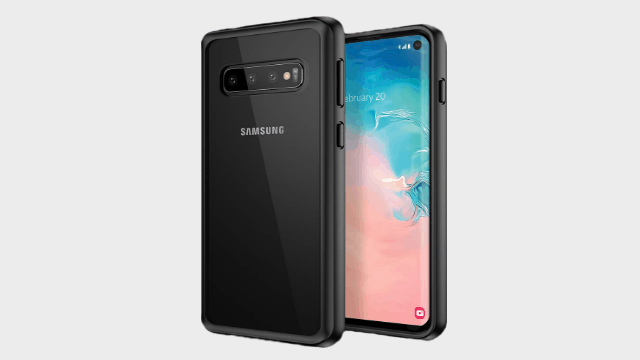 This cover for S10 is made from high-quality TPU material. This is carbon fiber and a soft TPU material that assures security from daily scratches, dirt, dust, grime and of course accidental bumps. There is no need to slip off the cover if you need to access any of the buttons, controls, and the ports. It also has dynamic aesthetics design surfaces that has a subtle wire drawing pattern. This helps in providing an extra grip and is also anti-fingerprint protected. We assure you, it will add style and substance to you as well as the lovely phone that you have. There are transparent ones that enhance and yet protect the classy glass body. There are also the rugged armored ones that will have the geeks and gamers grabbing them. Almost all have features that promise full protection from drops, bumps, and scratches. In addition, they boast of being multi-functional like a card and cash holders and even have a perfect kickstand. If you prefer anti-slip or even colorful leather cases, you will have found all of them here. 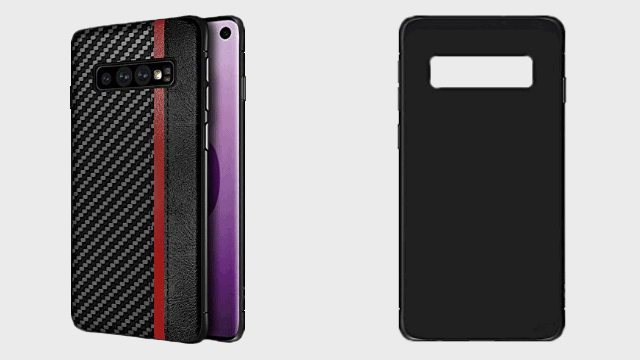 Now that you have a wonderful line up of covers and cases for Samsung Galaxy S10, we hope you are able to pick up one that suits your needs.